For this analysis I am going to discuss the section of State Bridge Road between 141 and the Chattachoochee and continuing as Pleasant Hill Road to Peachtree Industrial Blvd. The City of Johns Creek is preparing to spend a ton of money to “fix” this route. As is the City of Duluth. Other funds are also coming from various resource (which eventually do come out of OUR pockets). Every driver who has driven this route either westbound or eastbound knows that there are not one but two main issues along this route. They also know it is NOT the Chattahoochee River that is causing the issue for drivers. Peachtree Industrial Blvd at Pleasant Hill Road is a bottleneck intersection. 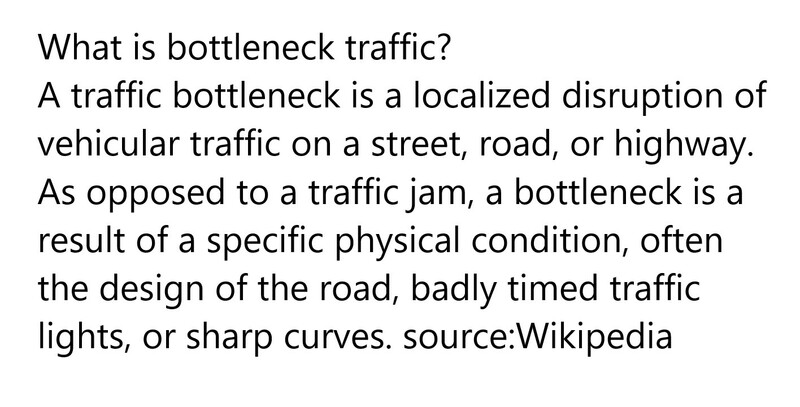 State Bridge Road at 141 is a bottle intersection. The number of Traffic lights(7) between Pleasant Hill Road and 141. If you look there is only one left turn lane from Pleasant Hill to PIB North. It needs to be at least two. And if you look carefully, the asphalt is already present to have three lanes east bound. The right turn only lane to southbound PIB is very underutilized. If the demand was there, however, there could be three lanes through and a dedicated right turn lane. What does this do? It gets close to 50% more vehicles through on every green light. The one additional lane adds 50% more capacity east bound. It’s simple math. Other improvements to this intersection are clear. There should be two left turn lanes on all sides of this intersection. This reduces the amount of time needed to halt traffic for those vehicles to proceed. Two left turn lanes on all four sides. Three lanes through on all four sides. Continuous flow right turn only lanes on all four sides, which then merge to three lanes. The performance of this intersection drastically improves by more than 50%. Why? The two left turn lanes provide a 100% increase in volume if the traffic light cycles remain as they are today. The through traffic on three of the four sides of the intersection see a 50% improvement if the traffic light cycles remain as they are today. Here is an aerial view of State Bridge and 141. This intersection is similar to the previous one I discussed, with a few exceptions: we have two left turn lanes at three of our four sides. However, we only have two lanes Westbound on State Bridge and it can be converted to three. We only have two lanes southbound on 141 and it could easily be converted to three. We only have two lanes northbound and it could also be converted to three, but we should add an additional right turn only lane from 141 North to State Bridge East. The ideal solution would be to make it a lane that is a continuous flow lane. So yes, I would encourage four lanes east bound on State Bridge between 141 and the last entrance to Home Depot. These suggestions would greatly improve the performance of this intersection. What’s the distance between 141 and Pleasant Hill Road? A mere 1.5 miles. How many traffic lights do you encounter during that stretch of driving? There are 9 traffic lights. Wow! That’s one light every 880 feet. Will widening the road to three lanes in each direction change that? No, it will not. Anyone that has driven the road during non-peak periods would know that they still get stopped often at one of the nine lights. Widening the road to three lanes only helps for the lights where you are waiting more than one light cycle to make it through the intersection. Both intersections at 141 and State Bridge and Pleasant Hill and Peachtree Industrial Blvd should receive the improvements I have suggested. Then, we need to change the light timing for the seven lights between to heavily favor traffic heading east and west. By this, I meant that the lights should be green for 65-75% of the time for east and west bound traffic. That is going to generate an issue and an opportunity. The issue is that the side access points will get access to the road slower than they currently have. But, once they have gotten onto the main road, they will cover greater distance in a shorter amount of time. Rest assured they will be thankful. What a dysfunctional intersection!!! Why does it even exist? And why has it not been improved? This intersection should have already been completely revamped. It should have at least a dedicated left turn lane and a dedicated through lane in each direction. How long must the light stay red on State Bridge to service these traffic movements? However, I’d go even further. Two left turn lanes to east and west State Bridge and two through lanes across State Bridge. This drastically shortens the amount of time that drivers on State Bridge must wait at this intersection. The bonus is we are only affecting commercial corners. Not the look and feel of Johns Creek. Take this technique and apply it to the seven other intersections and what is the result? More green time on State Bridge/Pleasant Hill Road, and less stopped time for you overall. But you are still going to be waiting at the intersections to let out the side street traffic aren’t you? If you have driven the road during non rush hours, it is still a time consuming drive. The Average speeds you can expect during non-rush hours today are 16 to 28 mph. Doing the same at Rush Hour(6:00p.m.) would change your travel times from 5-14 minutes to 3-10 minutes, an improvement of 40-66%. 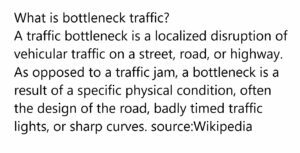 The Bottleneck intersections are the greatest impediment to travel along the State Bridge Pleasant Hill Corridor. Widening the road to three lanes does not resolve the problems. Eliminating the bottlenecks at both ends of this route will provide the greatest benefit. Intelligent improvements at the intersections along the route does. Agree or disagree, I want to hear from you. What are your thoughts? This entry was posted in Johns Creek, Taxes, Traffic, TSPLOST by EJ Moosa. Bookmark the permalink.